Some of the Duluth drill sample was dropped into CheMin on Sol 2061, but not enough for a proper mineralogical analysis. So the top priority for today's plan is to again test the new drop-off procedure. Since the drill feed mechanism became unreliable over a year ago, drill samples can no longer be sieved and processed in CHIMRA, as they were earlier in the mission. Instead, portions of the sample must be dropped from the tip of the drill directly into the analytical instruments. This new Feed-Extended Sample Transfer (FEST) procedure will be repeated on Sol 2064, over bedrock and over the closed SAM inlet cover. Mastcam images will be taken both before and after the drop-off in both locations, to allow the size of the sample portion to be estimated. The results of these tests will be used to inform future drop-off planning. We're planning 4 sols today so that the tactical operations team can take a day off for the Memorial Day holiday. More change detection observations are scattered throughout the plan, with Right Mastcam images of dark sand ripples at "Noodle Lake" and the Duluth drill tailings on Sol 2063 at 11:00, 15:00 and 17:00, on Sol 2064 at 7:00 and noon, and on Sol 2065 at 7:00, ~11:00, noon, and 15:00. The goal of these observations is to constrain the frequency of wind gusts that are strong enough to move loose material. The Rover Planners also requested multiple Right Mastcam images of the sample drop-off location on nearby bedrock for the same purpose; these are scheduled in the afternoons of Sols 2063, 2065, and 2066. ChemCam will also be busy this weekend, measuring the chemistry of a bumpy bedrock target named "Brule Mountain" and layered bedrock targets "Devil Track" and "Devilfish Tower" on Sol 2063. The latter two targets will be captured in a single Right Mastcam image soon afterward. On Sol 2064, ChemCam will observe some pebbles dubbed "Paupores" and Right Mastcam will acquire a single image covering both Brule Mountain and Paupores. Early on Sol 2065, Mastcam and Navcam will measure the amount of dust in the atmosphere, and Navcam will search for clouds. 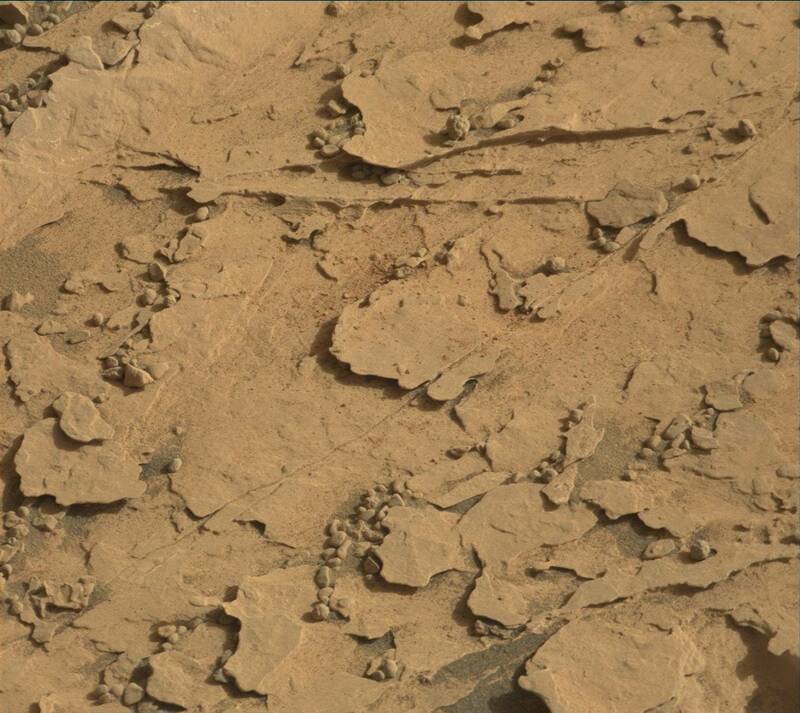 Later that morning, Right Mastcam will take a picture of a nearby bedrock block dubbed "Deerwood." In the afternoon, Mastcam will image the Sun and sky to measure the scattering properties and size distribution of dust in the atmosphere over Gale Crater, with supporting Navcam imaging.